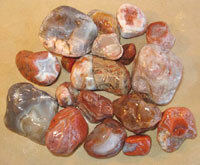 Many of you who know me are aware that I do not get much time to go out agate hunting. However, when I do go out -- especially when I go to Minnesota, I am able to put my knowledge to use. My poor eye sight requires that I get close to the rocks in order to see them. Of course, I always have my 10 power “eyes” on while agate hunting. Usually, I dig to get down to layers that others may not have searched. 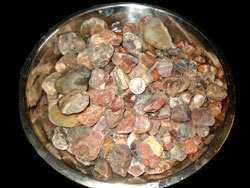 At the request of many museum patrons, I have included a picture of the bowl of agates I’ve found so far this year. I wish I could say I have found a “fister”, but so far one has eluded me. My friend, Renee Beaver, also makes a repeat visit to the web page. Earlier this month she headed to the beach after one of the storms. Some storms cover the rocks up and/or undertows them back into the lake. However, other storms mix up the rocks to perch new agates up on top. Apparently, the storm that preceded Renee’s agate finds was a GOOD storm. 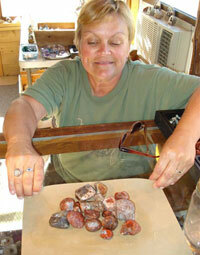 She found 16 good agates -- which for Grand Marais is a great day!